The sunny, flavorful yolk in your eggs over easy is the sole repository for the eggs' dietary cholesterol. Most of the dietary cholesterol you get from eggs doesn't find its way into your bloodstream and arteries, says the Harvard Medical School, but eating eggs still can increase cholesterol if you consume them in abundance, along with other foods high in saturated and trans fat. Cholesterol refers to the waxy, fat-like substance that travels in your bloodstream and sticks to the walls of your arteries, says the American Heart Association, or AHA. Your body manufactures its own cholesterol; only around 25 percent of it comes from dietary sources. When enough cholesterol builds up in your body, your blood cholesterol levels increase, putting you at risk for heart attack, heart disease and stroke. Of particular concern is your "bad" cholesterol, otherwise known as low-density or LDL cholesterol levels. This type of cholesterol acts as a transportation for all cholesterol, permitting it to move through your bloodstream and attach to your arteries. Surprising news from the Harvard School of Public Health indicates that dietary cholesterol might not be as bad for your health as you think. More closely associated with high cholesterol is unrestrained consumption of certain fats, specifically saturated and trans fats, which should be limited or avoided entirely in the case of the latter. It's still important to watch your dietary cholesterol, however, especially if you have diabetes. Keep in mind that a single large egg contains about 213 milligrams of cholesterol, all of which is found in the egg's yolk. Healthy people should eat no more than 300 milligrams of cholesterol each day. Cholesterol aside, an egg, sum total, is a rich source of vitamins and minerals, says the Harvard School of Public Health. One egg gives you 6 grams of protein and around 2.6 grams of healthy fats – polyunsaturated and monounsaturated fat – for a mere 72 calories, according to the Egg Nutrition Center. Choline, lutein and zeaxanthin are unique minerals found only in the egg's yolk; choline might help with memory function, while lutein and zeaxanthin can aid against vision loss. If you're concerned about the cholesterol in eggs, the Harvard School of Public Health suggests eating only the whites. For the sake of ease, you also can use egg substitutes or pourable egg whites. If your favorite recipe calls for whole eggs, you can use two egg whites per egg or 1/4 cup of egg substitute. Eating eggs can increase cholesterol if you can't stop with just one or aren't keeping an eye on the fat content in your meals. The Harvard School of Public Health indicates that one egg a day shouldn't harm your health if you're in good health. However, if you do eat one egg a day, it's important to limit dietary cholesterol from other food sources, as well as reduce saturated and trans fats. Eat vegetables instead of meat and stay away from milk products that are high in fat for the rest of the day. People with diabetes, cardiovascular disease or high blood cholesterol are restricted to less than 200 milligrams of dietary cholesterol each day. 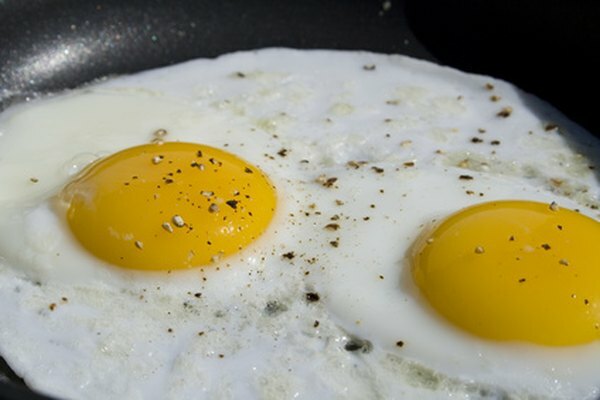 If you have these conditions, a whole egg should be scratched from your meal plan.